I ran for about six and a half miles at lunchtime, in the company of Claire and Jana. I forgot to stop the Forerunner, so don't have data but it was about 6.5 miles. The target for today was eight miles but I'll make up the balance. I was surprised to be quite fast on a three one-mile fast session this evening, 400m recoveries, with a mile warm-up and cool-down. It was a very fine evening and so soon after yesterday's long run, I think the times are not bad. I ran fifteen miles this morning. It was hard and hot and I went out to Firle Beacon, over Beddingham hill and down to the Ouse, back to Newhaven and then Seaford. So for the first time I've run so far since May. I have not run today, but will do 15 miles tomorrow morning. Yesterday I ran in the late afternoon round the back of the golf club. Sloes and blackberries are now in the hedges in abundance. Weekly figures will be presented with tomorrow's post. Down to the seafront I went on another dark morning, for six miles at steady pace. Today I ran six and a half miles (scheduled seven) round the back of the campus, accompanied by Claire We had the misfortune to meet not one but two herds of cows with a bull attached, and one of the bulls seemed very unhappy. I ran a hill session on Seaford Head this morning. It was dark when I got up at 5.45, and wet and stormy along the front. I could see lightning out to sea. I ran a mile warm-up and cool-down, and nine 200m climbs. I ran this morning to Alfriston, back down the Cuckmere valley and home by way of Seaford Head. I fumbled with the Forerunner, so lost a section in the middle of the run, I would guess about 2.5 miles. Nature notes: cormorants and an egret, fallen crab-apples yellow and red on the ground like billiard balls. And the previous evening I ran four miles. I ran on Wednesday with Claire and Jana, but without the Forerunner, which is liberating, for about 6 miles. 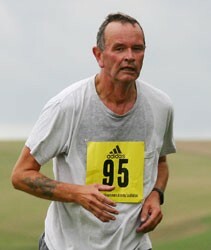 Early this morning I ran on Seaford front a three mile brisk session with mile warm-up and cool-donw. At exactly halfway, there was a brief shower, and I could see a rainbow out to sea.